*HOT! * Amazon – OUTREE Kids Pod Swing Seat 100% Cotton Child Hammock Chair for Indoor and Outdoor use (Blue) just $19.49 after Code (reg $38.99) + FREE Shipping! These are great!! 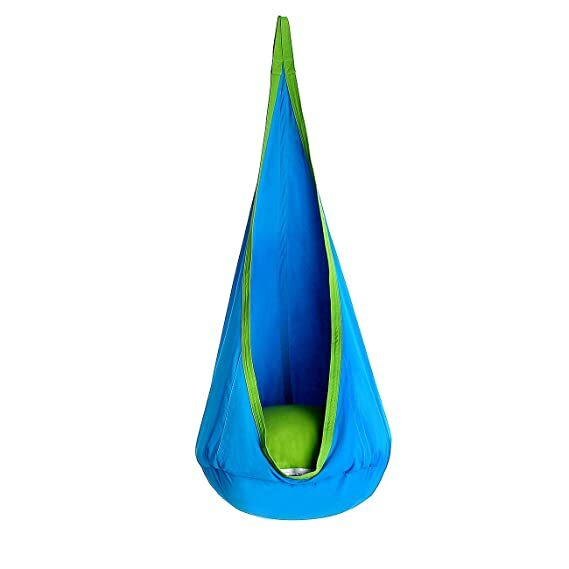 Score the OUTREE Kids Pod Swing Seat 100% Cotton Child Hammock Chair for Indoor and Outdoor use (Blue) for $38.99 – $19.50 with promo code OJN82I2C = just $19.49 with FREE shipping! You can order multiple swings at the discounted price in the SAME transaction! Universal Use: This hammock swing is great for indoor or outdoor use.It would make a great addition to any corner of a child’s room,especially a reading nook. It also would be nice with a jungle theme room. Easy To Install And Use: The hammock chair is different and quite comfortable to sit in while reading, watching TV or listening to music. It is an attractive piece to any child’s room that is unique and space saving. All Hardware Included: This kids swing is easy to hang and all hardware is included. It is a fun piece of furniture that can be easily taken down and stored away at any time to make more room. Safe For Your Kids: The Kids Pod swing can support up to 170 pounds. suitable for children aged 2 years and older.